Exposure: 6 x 360 sec IR/UV Block Filter (1x1), 5 x 180 sec RGB Exposures (2x2). Processing: Images were captured with Artemis Capture (as FITs). Aligned/stacked in Registax 3 and saved as FITS. Luminance, IR/UV Block, and Color channels were scaled and color balanced in Astroart. Channels were co-registered in Astroart. Curves and Levels applied in Photoshop to optimize object features. Star sizes were managed by selective minimum filtering on the larger stars.. Final LRGB combine was done in Photoshop using Luminance Layering (or LLRGB) - G2V calibration and Atmospheric Extinction factors were applied. Light noise reduction applied with mask on PixInsight LE SGBNR on the Luminance construction. Final Image size is approximately 1392x1044. North is up in this image. IC 4603 is the central nebulosity in this image with IC 4604 being the upper nebulosity surrounding three bright stars. The brightest of these star is Rho Ophiuchus. 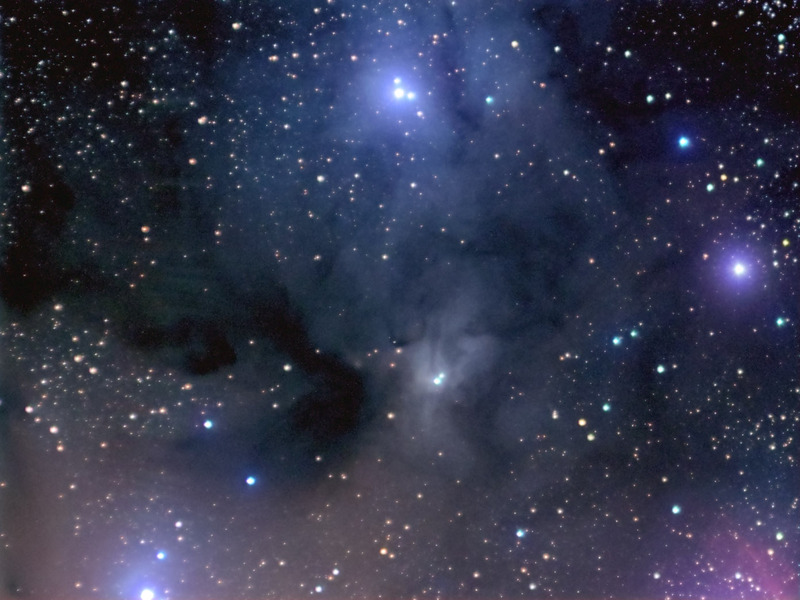 The lower left is a portion of the complex known as IC 4605 and the red emission area in the lower right is a portion of the emission complex known as SH2-9 . The Horizontal FOV is 175'. Image center is located approximately - Equatorial 2000: RA: 16h 25m 55s Dec: -24°06'13"